We talk to Frisky and Mannish (aka Laura Corcoran and Matthew Jones) about the virtues of playing larger venues, the shortcomings of Edinburgh dressing room facilities and the demands of staging their biggest show to date on this year's Fringe. A spitting, intermittent rain is making the turf soggy underfoot; a brisk, stinging wind ruffles our hair. The sky is slate-grey and mutinous and though we are in London in July the weather seems to be doing its damnedest to recreate something of the Edinburgh Fringe experience on the South Bank. It’s the day after Frisky and Mannish’s last performance in the big purple cow and we are sitting in the Udderbelly beer garden clutching some rather necessary cups of hot chocolate. Though they have a couple of tour dates left before Edinburgh, the next time Laura Corcoran and Matthew Jones will play this particular venue will be at this year’s Fringe. Their new show, Frisky and Mannish’s Pop Centre Plus is their biggest to date. After two years playing in the Bellydancer, part of the dank, cave-like Underbelly complex, “a place of disease,” they’re moving venues to the Udderbelly on Bristo Square. It’s a step up, though the dressing room facilities will still be distinctly Fringe-like, with a single full length mirror for the two of them to share. It’s easy to see why this might be an issue. The visual is such an integral part of their act: the corsets and the make-up, the wigs and the heels. Even off-duty, they look the part. Corcoran’s hair is pillar box red hair whereas Jones’s is dyed an inky blue-black, his eyes hidden behind Jackie O shades, his nails painted hot pink and aquamarine. 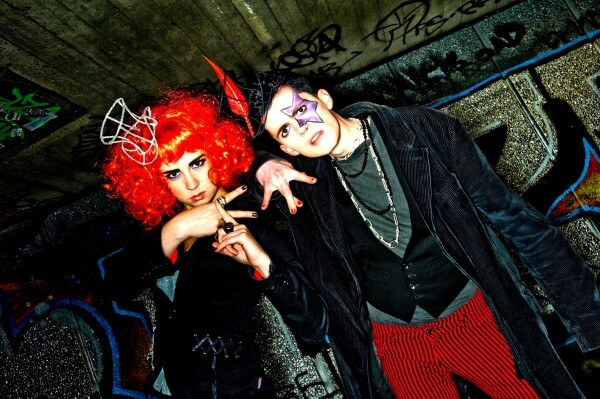 The pair met at Oxford (their stage names are lifted from a line in Byron’s Don Juan) and Frisky and Mannish was formed in 2008. Their first full length show School of Pop created a considerable buzz on the 2009 Edinburgh Fringe. Though the idea of parodying pop songs is hardly fresh, their stage rapport – Frisky with her cinched waist and disapproving glare, Mannish with his keyboard and quick tongue – their musical versatility and the evident affection for the material they were mocking, helped them transcend this: Frisky and Mannish make cabaret for the pop-literate, which made them a big hit with audiences on the Fringe. Things began to really take off for them after that. Their tour included stints at the Sydney Opera House and the Adelaide Cabaret Festival and this was followed by a festive cabaret at the Lyric Theatre in the West End, A Frisky and Mannish Christmas. Their 2010 follow up, The College Years, did not tinker with the formula, offering more of the same though tempered with a couple of digs at their own success. This year however they’re planning to step things up a gear.